I think this book's genre is somewhere between fantasy, dystopia, and something completely new. The heroine, a teenager named Liz, is killed by a hit-and-run driver. 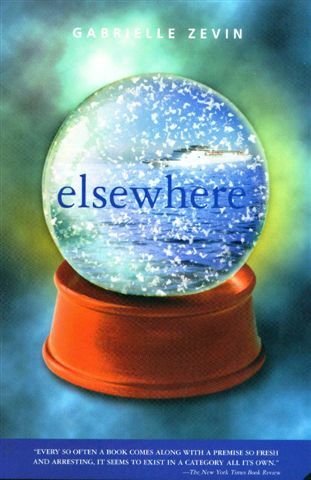 The next minute, she wakes up on a ship which she soon realizes is full of 'dead' people, headed for 'Elsewhere', the place where afterlife exists. There are animals in Elsewhere, there are dead people living normal lives, there are houses and cars and clothes and food. There is no death in Elsewhere, although there is something that resembles it. The residents of Elsewhere are getting younger every day. For as many years as their age was when they died, they live through a countadown that diminishes their age every year, until they can be sent back to earth as newborn babies and live all over again. I just wanted to mention this here, because with all the paranormal and undead characters appearing in YA fiction nowadays, it is easy to lose sight of the actual truth, the christian truth, the biblical truth. This being said, I was able to enjoy this book immensely, taking the world-building as a metaphor for our lives. Imagine living with your future all laid out before you. Imagine a world where there is no death, but where everyone's life moves with precision, getting younger every year and inevitably moving on as preordained. Takes some of the pressure off right? There are very few criminals if any, there is little use for money, and the greatest danger of all, are the telescopes from which you can see life back on earth, a habit which soon becomes an addiction for our heroine. She struggles to accept the loss of her life, she hates the fact that she has to live with a grandmother who died before she was born but who is now around thirty years old and is consumed by plans of revenge for the driver who killed her. But she can't go back, and she can't kill herself. So she has to live. That's what made me love this book. The fact that life is inevitable in this Elsewhere society was one of the most brilliant, most thought-provoking ideas I have ever seen in a book. And the author handles it beautifully. The writing flows easily, the sentences are short, the humour and the sarcasm are most definitely there. Imagine a ten year old with the mental age of seventy. That's good humour, is all I can say. There is also romance in this book, there are difficult moral dilemmas, there is grief and there is playfulness. But most important of all there is a journey, which takes a self-absorbed girl, mourning her lost life, and transforms her to a wise, strong, happy person, in charge of her feelings and her choices. She was angry that she would never have the experience of falling in love, but, complicated though Elsewhere is, there are still possibilities over there. The ending just took my breath away, and the lovely picture on the cover if this edition is one of the sweetest -although a bit painful- scenes in the book. There is real love in this book, kindness and goodness, the overcoming of one's flaws, and the revealing of the good side that is in our hearts. The characters range from understanding, bored, frustrated, full of hate and full of goodness. And then they all are transformed, both physically as they are getting younger and spiritually, as they are forced to take life slowly and they struggle to find something to live for, since death is out of the way. Life on an earth with another name, and with all the pressure off. This sentence sums up the awesomeness that is this book. I will look for more books by this author, because I admired both her mind and her talent in this book. The only thing that takes a point out of the rating is the reencarnation thing, but as I said before, I chose to look that as a metaphor, a parable, of how our life would be, were our thinking and our goals different. Also, the animal thing annoyed me a little, but it was not a major issue (animal loves out there will be extatic I think). If life is not a race against death, then what it is? Maybe it is just moments, good and bad, all linked together, and an effort to help other people and be happy. That's what I got fom this book at least.